Chicken McHead is a four-piece band based out of Southwick MA. When you think about Chicken McHead, think The Cramps, The Modern Lovers, or Mudhoney (among others) although, I honestly didn’t hear any of those influences. In fact, I was thinking kind of Weird Al Yankovic or Doctor Demento the whole time. The release is called Squawk and contains 13 tracks. 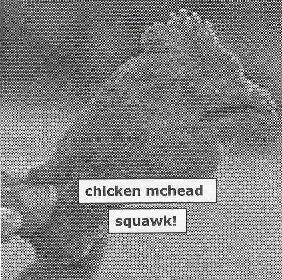 The McHead CD, which gets its name from the infamous chicken head Mcnugget fiasco from a few years back, was kind of humorous at first but had me yawning by the end. Not my cup of tea. However the record was engineered fairly well to fit the band’s sound, and the vibe of Chicken McHead as a live band was totally evident from what I heard. McHead may be fun to see live but I was really feeling release. Still, too campy for my taste. But, I am not going to slam it because I don’t like it. If you are a fan of the aforementioned influences of the band, check out Chicken McHead, not me though I’d rather listen to some Paul Edwards, 1979, or DJ Shadow tracks. For more information you can visit the Chicken Mchead web site at: http://www.geocities.com/chickenmchead1. Email at: chickenmchead1@aol.com or kgrave2000@hotmail.com. Contact via snail mail c/o Dagger Records; PO Box 380152; East Hartford, CT 06138.